I've never been a big fan of NPR's Guy Raz but his handling of the coverage of the debt crisis was very good today, peaking with this interview with Felix Salmon. There is a strong strain of Straussianism in the conservative movement. Of course, not all prominent conservative intellectuals believe that you have to lie and oversimplify to move the masses in the best direction for society, but pretty much all have accepted and, more importantly, internalized the fact that many of their colleagues do believe in the need for these noble lies. Once you've internalized the idea that people in your circle are smart and sane but occasionally make ludicrous statements for the benefit of the crowds (call it the Elsinore strategy -- feigning madness), it becomes easy to ignore craziness in your own party, particularly when there's a penalty for suggesting the alternative (see Bartlett and Frum). In other words, we have something like conservation of cynicism. The Straussian assumes the worst about the masses, but has an excuse to assume the best about allies, even when they give every indication of being crazy and/or stupid. The result is that it has taken smart, sane conservatives far too long to acknowledge what's going on with House Republicans. The consequences of this lack of cynicism is spelled out in detail in excellent posts by Jon Chait and Paul Krugman. Still in the middle of a move but here are some of the posts I'm trying to find time for. Given the speed at which events are moving, I thought I should at least get something out in preview form. -- The worst thing about the Tea Party from a Republican perspective is not the movement's extremism. If a (slightly modified) modified stag hunt is an appropriate analogy, players who decrease the chances of a successful hunt (by demanding you take unpopular positions) and who are disloyal (bolting to third party candidates when offended) are the worst possible allies. -- When Straussianism makes people insufficiently cynical. Conservative thinkers may have underestimated the danger of a default crisis because they assumed the rhetoric coming out of the Republicans in the house was fodder for the masses rather than sincere statements. -- Fox News and flawed control systems. -- Political science models may tell us that spouses don't effect candidates' chances, but how far out of the range of data is Michelle Bachmann's husband? I really want to make sure that this post from Megan McArdle isn't overlooked in the discussion of the debt ceiling. There are not a lot of bloggers who have been in my situation in my 20's -- desperately poor and with a difficult medical condition (that was not my fault). But she has. This is actually not inconsistent with other findings. For example, every time we get a health care expansion, people predict large falls in emergency room usage. Supposedly, we'll save huge sums by shifting people from expensive ER visits to cheap primary care sessions. Unfortunately, the savings have been elusive; in Massachusetts, the largest such experiment we have to date, ER visits actually rose. Why? ER's are much more convenient. The working poor usually have much less flexibility in their schedules than the middle class. They work shifts, they may need a doctor's note to miss work, and if they don't work, they often don't get paid. Note that this implies a totally different solution to the problem of "non-emergent ER visits": urgent care or "Minute Clinics" that work odd hours. Otherwise, you just cram even more people into the same ER space*. It is easy to come up with "Just So" stories in health care. The reforms always sound wonderful, and the benefits always unfold in a beautifully logical way. Unfortunately, people, and reality, are rarely as predictable as the models. When you are short of money for food, leaving work to sit in an MDs office is a major sacrifice. If you are here in the Southeast and do not drive then the cost in time to make it via public transit can be huge. I have seen sick days used as a part of evaluations. I have worked in a small business where I was the only person in the store and leaving it would cause a crisis. If you are dying of a myocardial infarct then leaving your job is clearly the right decision. But I would leg infections that started small . . . and sometimes did not progress. If I was able to get an antibiotics prescription then I'd avoid the ER. I have tried going to "minute clinics" but they all refuse to treat because it was not on the symptom list. A last minute appointment at an MDs office was a huge issue. I saw some good signs of improvement in Seattle where they put an urgent care clinic (open until something like 1 am) right next to the ER. I joined that HMO and it made a huge difference in my quality of life when a medical event happened. These days I am a professor and these issues are lessened. But I think it is worth keeping in mind just how crucial these services can be for the poor, even if they are unpopular with people who work a 9 to 5 schedule. "Looks like I picked the wrong week to quit sniffing glue"
A busy, busy end of July here on the West Coast, professionally, personally and socially. The movers come tomorrow. Perhaps I can get the OE posting queue moving shortly after that. In fact, the opposite is true — ask anybody who has experienced both wealth and poverty. When you’re wealthy — when you have a nice capital buffer to absorb mistakes — you don’t worry so much about running risks, and you’re significantly happier than when you’re poor and you have to be much more worried about where your money might end up. Insurance improves living standards, it doesn’t detract from them. Let’s have more of it. But NPR's morning edition has been doing a great series on failing schools. Having taught in the Mississippi Delta, this piece on rural schools struck particularly close to home. Just when I was losing faith in the medium on this story, American Public Media's Marketplace had segments today digging into the impact of the (manufactured) debt crisis, both in terms of immediate unemployment and long term effects. I think it is easy to over-estimate ideology among members of wall street because a few of them have decided to spend their wealth on political activism. But, for most businesses (especially in banking), the goal seems to be getting paid and it is worth remembering that. Narrowly averting a disaster is only of limited value if structural incentives (and poor journalism) ensure that it happens again and again. When journalists are determined to find a way to assign equal blame to both sides in every crisis and foul-up, there can be no real accountability and without accountability, a democracy cannot function. If reporters were willing to go where the story led them instead of slavishly following a perverted view of 'fairness,' then politicians would face some consequence for gross irresponsibility. And look at what this does to incentives: no matter how badly Republicans behave, they don’t draw condemnation from the Very Serious People. All you get is tut-tutting about how politics is awful, and if only we had a third party to install Mike Bloomberg as dictator president all would be well. Pundits who won’t call out extremism without pretending that it’s symmetric aren’t a big part of our problem, but they are a part of our problem. He's wrong. They and journalists like the Washington Post's Felicia Sonmez are a big part of our problem and more; they are a necessary condition for the mess we're in. Josh Marshall takes an in depth look at this idea here. The ever interesting Felix Salmon has reasons for optimism about the future of Paywalls. In particular, he notes how the porous paywall of the NYT beats the FT paywall (which is consumer unfriendly and annoying). This is a principle worth keeping in mind -- there are virtuous circles as well as vicious ones. Not only does the NYT get to collect predictable revenue from a steady stream of subscribers (and predictable revenue is worth a lot), it also gets an advertising boost from being able to identify these readers. It's an amazing outcome and I remain delighted that it worked out for them. Now I wonder if we could try and apply these principles to public health. How can we create incentives where patients identify themselves in ways that save money and are happy to do so? Because when you manage to get these sorts of two for one punches, efficiency is massively improved. The idea that the economy will suffer if we modestly raise taxes on upper-income Americans is belied by recent history: we increased tax rates on the rich in 1993 and the economy created more than twenty-two million jobs; we cut them in 2001 and the economy created fewer than seven million jobs. But it is clear that there were a lot of confounding variables between the two time periods. Still, it is interesting that most people seem to immediately see a link between raising taxes and lower economic growth. Why are we so sure about this link, given the weak relation seen historically? It's a really challenging problem and, worst of all, one that data can't really help us with. This American Life takes on Nathan Myhrvold's Intellectual Ventures. What more do you need? There are trigger issues in which the GOP no longer reflects the thinking of mainstream Americans of either party. In Tuesday's charade as the House put the Tea Party debt legislation to a vote, what we saw was an example of the kind of coalition voting common in Europe, where separate parties arrive at an agreement to govern. There are now essentially three parties in Congress: Democrats, Republicans, and the Tea Party. Reasonable Republicans with a sense of the possible do not subscribe to the Tea Party's implacable ideology, but they feel they must deal with it to placate its zealots. They are essentially in a coalition with a third party. Second, this is a demand Obama can’t accept, unless he plans on changing his party registration. Health reform doesn’t work without a mandate (remember the primary? Maybe better not to). And if health reform is undermined, Obama will have achieved nothing. So by adding this demand, Republicans were in effect saying no deal . . . The alternative interpretation is that there is a large segment of the US population that would rather freedom to choose health care than efficient health care. The focus on individual decisions over public well being has implications on a whole host of medical decisions affecting issues like: disease management, fraudulent medications, antibiotic resistance and so forth. It is hard to see a clear road forward when there is a legitimate difference in such basic questions of health care organization. •You just cut the IRS and all the accountants at Treasury, which means that the actual revenue you have to spend is $0. •The doors of federal prisons have been thrown open, because none of the guards will work without being paid, and the vendors will not deliver food, medical supplies, electricity,etc. •The border control stations are entirely unmanned, so anyone who can buy a plane ticket, or stroll across the Mexican border, is entering the country. All the illegal immigrants currently in detention are released, since we don't have the money to put them on a plane, and we cannot actually simply leave them in a cell without electricity, sanitation, or food to see what happens. •All of our troops stationed abroad quickly run out of electricity or fuel. Many of them are sitting in a desert with billions worth of equipment, and no way to get themselves or their equipment back to the US. •No federal emergency assistance, or help fighting things like wildfires or floods. Sorry, tornado people! Sorry, wildfire victims! Try to live in the northeast next time! •Housing projects shut down, and Section 8 vouchers are not paid. Families hit the streets. •The money your local school district was expecting at the October 1 commencement of the 2012 fiscal year does not materialize, making it unclear who's going to be teaching your kids without a special property tax assessment. •The market for guaranteed student loans plunges into chaos. Hope your kid wasn't going to college this year! •The mortgage market evaporates. Hope you didn't need to buy or sell a house! •The FDIC and the PBGC suddenly don't have a government backstop for their funds, which has all sorts of interesting implications for your bank account. •The TSA shuts down. Yay! But don't worry about terrorist attacks, you TSA-lovers, because air traffic control shut down too. Hope you don't have a vacation planned in August, much less any work travel. •Unemployment money is no longer going to the states, which means that pretty soon, it won't be going to the unemployed people. I think that this post highlights just how desperately we need to increase tax revenues. Even if we might one day repeal them in the face of a lower burden of government spending, the most logical equilibrium seems to be to pay more now and reduce taxes once we work out what we don't want the government to do. I also have no patience for the dynamic Laffer Curve -- as Noah Smith so nicely pointed out, that line of argument rather suggests Sub-Saharan Africa should have emerged as the great power after the horrible tax policy of the European, Asian, and American nations. Taxes can have bad effects but so can persistent unemployment! The key, I believe, is that "rationality" is a good thing. We all like to associate with good things, right? Argument 1 has a populist feel (people are rational!) and argument 2 has an elitist feel (economists are special!). But both are ways of associating oneself with rationality. It's almost like the important thing is to be in the same room with rationality; it hardly matters whether you yourself are the exemplar of rationality, or whether you're celebrating the rationality of others. This is an excellent point but I'd go further. The economist's 'rationality' is, as mentioned before, analogous to the statistician's 'significance.' Both are highly specific terms that are just close enough to their general usage to get people into trouble. There's nothing wrong with having a specialized, field specific definition for rationality; there is something wrong with using confusion over different meanings of the term to make yourself look good. Argument 1 is associated with "why do they do that?" sorts of puzzles. Why do they charge so much for candy at the movie theater, why are airline ticket prices such a mess, why are people drug addicts, etc. The usual answer is that there's some rational reason for what seems like silly or self-destructive behavior. Argument 2 is associated with "we can do better" claims such as why we should fire 80% of public-schools teachers or Moneyball-style stories about how some clever entrepreneur has made a zillion dollars by exploiting some inefficiency in the market. I think that this insight is quite compelling and exposes a real issue with popular micro-economics. After all, these two positions mostly contradict each other! I see this contraction arising for different reasons than Andrew does. I think that economists are often forced to make strong assumptions in order to deal with the sorts of complex problems that they look at. So they presume rationality on the part of all actors when trying to explain problems (i.e., descprive work). But when they want to improve matters they shift and reject this assumption (as it would suggest everything is already optimized). So they make different (strong and unverifiable) assumptions depending on whether they are trying to explain behavior or give guidence to improve outcomes. What seems to be more alarming to me that is that this pool of economists often don't "sanity check" the effect size of their analysis. Perhaps it is my background in epidemiology, but if I see a hazard ratio of 5 then I am immediately suspicious that it is too good to be true. However, Ray Fisman can see an analysis that suggests firing 80% of teachers and not necessarily wonder if perhaps there is an overly strong assumption in his analysis (like the pool of new potential teachers not having finite limits or in the real sensitivity of the evaluation process). In what might be considered a commissioned blog post, Jonathan Robinson manages to dig up some comments that Steven Levitt would probably like to rebury. It is, of course, possible to make too much of a bad call or even a bad argument. If the penalty for being wrong is too high it inhibits the conversation, but there does have to be some kind of accountability. When you're this far off on something this big, you really ought to do something: modify your reasoning, concede that your assumptions may need some work, maybe even just acknowledge the error but dismiss it as an anomaly. 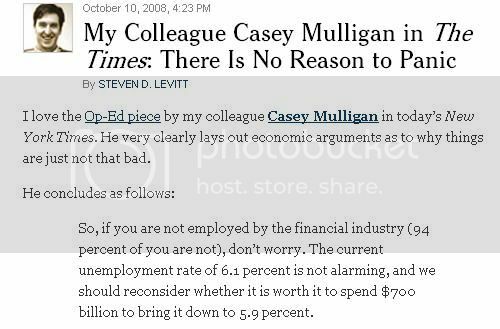 Instead, we have a debate where, as Paul Krugman has repeatedly pointed out, no one ever has to admit he or she is wrong. You will occasionally see someone step up, but it's strictly done on a volunteer basis. Maybe we need to go beyond the honor system on this one. 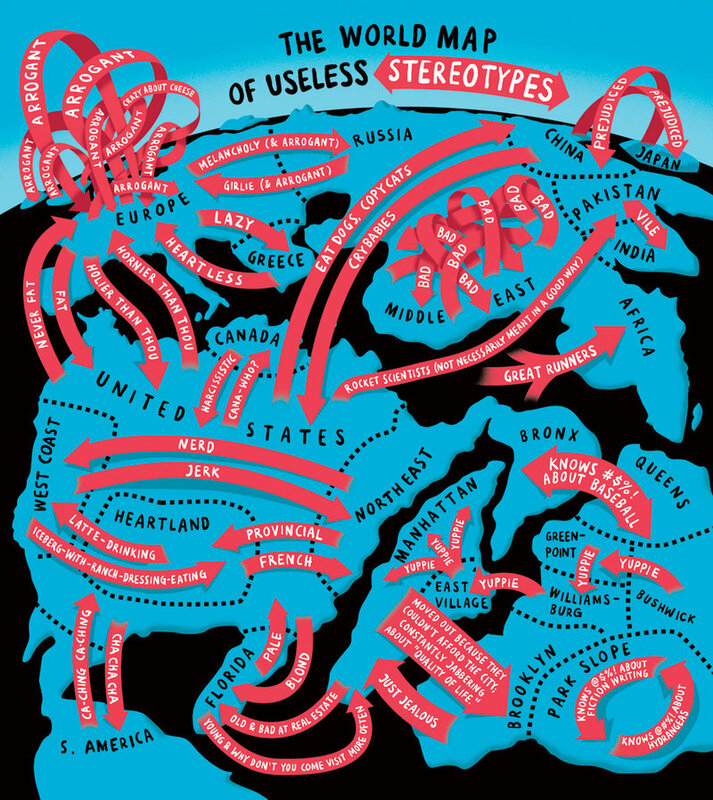 Intentional or not, Christoph Niemann has perfectly captured New York journalists strange belief that the rest of the country is fascinated by the minutia of NYC (the relative size of Park Slope and Africa is particularly telling). As at least one commenter noted, this would seem to be a remake of the classic Saul Steinberg cartoon without the self-awareness. I have reviewed the Mercer compensation study and have reflected on its market premises, which provide the justification for your proposed salary boost of more than $100,000. The assumption is that you cannot find a qualified man or woman to lead the university unless paid twice that of the Chief Justice of the United States. I reject this notion. This is a very odd American idea: that without a huge salary, no competent person can ever be found. I am not sure that this idea passes the "laugh test" as seen by Governor Brown's comments. It also has some very pernicious effects on things like income inequality and the perception of fairness (this has not been the best time for California universities from a fiscal point of view). I am happy to discuss these matters from first principles but the idea that qualified people cannot be found for less than absurd amounts of money is just berserk. Another really outstanding piece of journalism from TAL, this time focusing on the extraction of natural gas from Pennsylvania's Marcellus shale. You can download it for free today and tomorrow but I'd encourage you to donate a few bucks if you can. They do good work. The deeper thing going on here is what might charitably be called a momentum trade, or what might less charitably be called a sell-low strategy. First you pick your sector, then you pick funds in that sector. If the funds do well, that’s great; if they do badly, then you sell those funds and instead you buy funds which did do well over the time period in question. Then, next year, presumably, you rinse and repeat. I understand that there's more to investing than buy low/sell high, but many investment strategies seem to strive for the opposite. Wouldn't there have to be an unreasonably big momentum factor for this to make sense? OE readers have the coolest noms de plume. I’ll note, however, that you might be a freshwater economist if you think it makes sense to reassure us that a deflationary spiral is impossible because your model says so even though deflationary spirals do, in fact, occur in human history. To me, a model that denies the possibility of something happening that does, in fact, happen indicates that you’re working with a flawed model. I can't comment on whether or not this is a fair assessment of the work in question. But it is always a good idea to "reality check" model outputs and ensure that the distribution of events generated by the model looks something like real data. If important events occur in real data that your model dismisses as impossible than model misspecification or missing confounding variables should be immediately suspected. EDIT: Noah Smith also comments and it is well worth the read. He traces these conclusions to some rather strong assumptions . . .
“Spend less money, create more jobs” is the kind of world one normally finds only in Woody Allen movies, and it’s a profoundly unserious stance for any politician to take. Spending cuts, whether they’re implemented by the public sector or the private sector, are never going to create jobs. And there’s simply no magical ju-jitsu whereby government spending cuts get reversed and amplified, becoming larger private-sector spending increases. I think that one of the difficulties in macroeconomics is that you have complex systems that are not subject to experimentation. So you are forced to try and use observational studies and analogies with microeconomics to try and determine the causal effects of policies. Even instruments are questionable as they also rely on unverifiable, strong assumptions. The inability to have a consensus on the counter-factual is pernicious and causes no end of trouble. Consider the tax increases passed at the beginning of the Clinton administration. Are they responsible for the late-1990's boom, unrelated to it, or did they act to slow it down (making the current economy smaller than it could have been)? How would you know this? Cross country comparisons are possible but you have both confounding factors and effect measure modification. Changing the tax rate in Sweden might have different consequences than in the United States due to both different cultures (confounding) and to differences in current tax rates (effect modification). So, by picking different analogies and different models for the observational data, we can end up with some really strange claims being made about how economies work. It is not an area with easy solutions. But I think to agree with Felix that the model he is critiquing is making heroic assumptions about the influence of tax levels on economic growth. The thing I know about Greek tax-evasion is that they know where you live when you hook into the electric grid. So a family I know, owning a small island, avoids paying any taxes by running everything on wind and solar power. Elevated levels of phosphorus (P) and calcium (Ca) have been shown in observational studies to be associated with an increased risk of adverse clinical outcomes including mortality. Vitamin D sterols have been shown to increase the risk of hypercalcemia and hyperphosphatemia in clinical trials. We sought to explore these risks in real-world clinical practice. We employed a case–crossover design, which eliminates confounding by non-time-varying patient characteristics by comparing, within each patient, vitamin D doses before the event with those at an earlier period. Using this method, we estimated the risk of hypercalcemic (Ca ≥ 11 g/dL) and hyperphosphatemic (P ≥ 8 g/dL) events for patients at different dose quartiles of vitamin D relative to patients not on a vitamin D sterol. There was a dose-dependent association between vitamin D dose quartile and risk of hypercalcemia or hyperphosphatemia. In adjusted analyses, each increase in vitamin D quartile was associated with a multiple of hypercalcemia risk between 1.7 and 19 times compared with those not on vitamin D and a multiple of hyperphosphatemia risk between 1.8 and 4. Use of vitamin D sterols is associated with an increased risk of hypercalcemic and hyperphosphatemic events in real-world clinical practice. Other potential predictors of these events, such as phosphate binder use and dialysate Ca levels, were not examined in this analysis." In our sensitivity analysis, we used 1-month periods to assess vitamin D exposure. In this analysis, estimates of the association between vitamin D dose and risk of events were smaller than those in the primary analysis, particularly for hypercalcemia. One possible explanation for this finding is that the average 2-month exposure measure is a superior indicator, compared with the 1-month assessment, of both the dose and duration of vitamin D exposure. As well, it could be that some dose changes in the month prior to the event had already occurred in response to increasing Ca levels and that, for this reason, the dose 2 months prior to the event is a more accurate reflection of the dose that gave rise to the hypercalcemic or hyperphosphatemic event. Another explanation that I did not see addressed is the possibility that there is a time trend occuring. If the frequency of vitamin D administration (or the dose) increased with time then you would expect to see smaller estimates in the sensitivity analysis as well. But it would be an artefact of changing exposure over time. That being said, it was a real pleasure to read a well justified use of the case-crossover design in a medication paper. Hopefully this is a sign that there will be more use of with-in person study designs in the future in epidemiology. The ability to handle time invariant confounders is a serious advantage of this approach. Frances Woolley has a post on the use of the inverse hyperbolic sine transformation for handling wealth as a variable (skewed and with lots of zeros). The post is worth reading and the comments are really interesting. In particular, Chris Auld makes a very good case for simplicity and interpretability as a desirable property of statistical models in several of the comments. There is also a thought provoking discussion of how to parameterize wealth that involves the sort of deep thinking about variables that we should do more of in epidemiology. In particular, in what sense is it reasonable to consider a person (especially in a country like Canada with strong entitlement programs) to truly have zero wealth. James Surowiecki has posted a thoughtful piece on Greece's culture of tax evasion, but it was this fairly trivial though amusing detail that caught my eye. Wired's Jonah Lehrer has a good post on the use of simulators to train pilots. The disagreement within United Continental revolves around using fixed-base simulators—which don’t mimic the movements of planes in flight—rather than full-motion devices to conduct certain types of mandatory, recurrent pilot training. A decade ago, Continental received Federal Aviation Administration regulatory approval to use such devices, costing roughly one-third less than full-motion simulators, during the last phase of periodic proficiency checks for pilots flying its Boeing Co. 777 fleet. Continental was moving to expand the practice to its Boeing 737 pilots before last year’s merger agreement with United shifted the combined airlines’ focus to integrating all FAA paperwork. Continental believes its novel approach is superior to traditional practice by stressing human factors and cockpit interaction and thereby enhancing safety. But the position, according to some safety experts, appears to run counter to at least some of the latest guidance coming from parts of the FAA and international standard-setting groups such as the International Civil Aviation Organization, an arm of the United Nations. I can only hope United/Continental has some solid research to support this proposed change, because it strikes me as a bad idea. For starters, there’s no reason to mess with success, even if it saves a few dollars. And modern pilot training is an astonishing success story. Let’s begin with the dismal history: Despite a long list of aviation reforms, from mandatory pilot layovers to increased classroom training, the percentage of crashes due to pilot error refused to budge from 1940 to 1990, holding steady at around 65 percent. It didn’t matter what type of plane was being flown, or where the plane was going. The brute fact remained: Most aviation deaths were due to bad decisions in the cockpit. What caused the dramatic reduction in pilot error? One widely cited factor is the introduction of highly realistic flight simulators, starting in the mid 1980’s. (The first simulators were put into place during WWII, as the Air Force didn’t have enough real planes to train thousands of new pilots.) For the first time, pilots could practice making decisions in extremely stressful conditions. They could refine their reactions to a sudden downdraft in a thunderstorm, or practice landing with only one engine. They could learn what it’s like to fly without wing flaps, or land on a tarmac glazed with ice. And they could do all this without leaving the ground. The benefit of a flight simulator is that it allows pilots to internalize their new knowledge. Instead of memorizing lessons on the blackboard, they were forced to exercise emotional regulation, learning how to stay calm and think clearly when bad stuff happens. (I’ve been in these realistic flight simulators and let me assure you – they can be terrifying. After I crashed my jetliner, I left the simulator drenched in sweat, all jangly with adrenaline.) The essential point here is that pilots were the first profession to realize that many of our most important decisions were inherently emotional and instinctive, which is why it was necessary to practice them in an emotional state. If we want those hours of practice to transfer to the real world – and isn’t that the point of practice? – then we have to simulate not just the exterior conditions of the cockpit but the internal mental state of the pilot as well. For far too long, we’ve assumed that expertise is about learning lots of facts, which is why we settled for the “chalk and talk” teaching method. But it’s not. True expertise occurs when we no longer need to reference facts, because we already know what to do. The moral is that we need to make our simulators more realistic, not less. Pilots have pioneered a key concept in professional training. It would be a shame if airlines began to backtrack to save money. What's notable here is that the cost of the technology behind these simulators has dropped over the past twenty-plus years and will almost certainly drop further over the next twenty, while the potential costs of this change remain high (imagine the legal and reputational consequences when one of these pilots is involved in a crash, even if the official cause is not pilot error). Unless there's more to this story, shifting to less realistic simulators would seem to be a classic case of cost-cutting that defies cost-analysis. This kind of thing is not hard to find in both the private and public sector. It can usually be attributed to a lack of alignment (the people devising and championing these proposals get their bonuses and promotions almost immediately. By the time true costs become apparent, attrition and short institutional memories will rule out any significant repercussions. *) and to an understandable but dangerous tendency to believe in easy answers. *Thank God the financial sector is immune to this sort of thing. The whole enterprise just smells to me like the latest variation on “let’s privatize Social Security” or “let’s replace Medicare with vouchers.” It’s the wealthy and their worshippers sloughing off any social obligation, basically dropping the ladder behind them. If that weren’t the case, if they actually believed what they said, I’d expect to see the best and brightest from Choate and Philips Exeter eschewing college and doing startups or joining the military instead. Um, no. I had not made this connection but it does seem to be a coherent interpretation of an otherwise puzzling argument. I must admit that I remain mystified with the current interest in the United States with disassembling the social infrastructure. Not only is it in the opposite direction of most countries, but the ones that have tried it seem to end up being bad places to be. Think of Russia, for example. The real issue, to me, is that the real remedy to these types of escalating prices is the high quality public university system that countries like Canada and states like California have. The University of California is a high quality set of institutions and much less expensive than the alternatives. Why is this approach not the one that rising prices brings us back to? Okay, we'd have to go back to the brutal taxes of the Reagan or Clinton eras, but I am not convinced that this move would lead to an immediate dystopia. Don’t believe me? Amazon has killed Borders. Barnes & Nobles looks like it’s next. We’re not far from a time when the only vendor for books are virtual stores. And we’re not that far off from a time when print books are so expensive thanks to shorter print runs, folks will be forced to buy electronic media or not read at all. It does make one wonder about shorter print runs and whether publishing on demand can keep with the cost of mass print runs or not. I am not informed, either way, but if it cannot them it's going to be tough to beat eReaders. I'm in the middle of a busy weekend, so I can't do justice to Brooks recent education column and Jonathan Chait's affectionate follow-up. Besides, regular readers can probably shoot down the fallacies as well as I can. I can't, however, let this pass with getting off a quick shot just to get things started. If you orient the system exclusively around a series of multiple choice accountability assessments, you distort it. If you make tests all-important, you give schools an incentive to drop the subjects that don’t show up on the exams but that help students become fully rounded individuals — like history, poetry, art and sports. The assumption that schools have had to make tests "all important" has deeply penetrated the debate, but it's not accurate. Different states have different ways of measuring teacher performance. But none of them use student test scores as more than 50% of the measure. Classroom evaluations and other methods account for half or more of the measures everywhere. I've also noticed, anecdotally, that many people assume test measures use a single, blunt scale so that poor children are measured against the same standard as wealthy ones. That's not true, either. Test measures account for socioeconomic status, and measure student improvement over the school year. 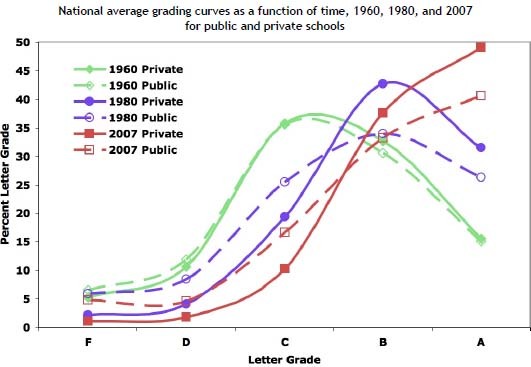 Now, this isn't to deny that some schools and teachers over-emphasize a narrow curriculum. But the non-test components of a teacher evaluation method can easily incorporate broader measures of student performance. Just to sum up, we don't have to worry about schools dropping subjects that don't show on certain tests because these tests are only a part of the teacher evaluation. This is one of those, for lack of a better word, arguments that leaves you wondering if you missed something. When a superintendent and a principal try to decide whether or not to hire an art teacher, does the non-test component of teacher evaluations guarantee the hiring in some less than obvious way? Whatever scheme we can come up with to collect lost sales tax is one more step towards a level playing field for brick and mortar retailers, and a re-funding of our cities, counties and states. It's not an enormous amount of money, but it's a step in the right direction. Online retailers got a free pass in the early days, a kind of nod for fledgling e-commerce. Unfortunately, monsters were created and none is bigger than Amazon, destroyer of worlds and loser of a billion dollars of their own capital. But hey, it's an Internet company, we're willing to look the other way for a decade or so while the new world order manifests. It's time to level the playing field and make everyone play by the same rules. The article as a whole is worth reading. I know a lot of people argue that the loss of physical book stores is not a tragedy. But it is not clear to me thast we should be subsidizing their competition, either. Nor is it a great idea to reduce government revenue at a time where margins are tight. So maybe I am on California's side in this discussion. For those keeping track, Jonathan Chait has now chastised both David Brooks and the National Review's Jim Manzi for being too moderate on this subject. University of Michigan to stop worrying about lawsuits, start releasing orphan works: Bobbyg sez, "The University of Michigan Library will be sharing digital copies of their orphan works, that is, copyrighted works which have no identifiable owner, with the University community. Paul Courant, the University Librarian, says that the project is integral to the mission of the library, and that the sharing of the orphan works is a 'fair use' of the material, stating that 'sharing these orphan works does no economic harm to any person or organization, while not doing so harms scholarship and learning...'"
The Orphan Works Project is being led by the Copyright Office of the University of Michigan Library to identify orphan works. Orphan works are books that are subject to copyright but whose copyright holders cannot be identified or contacted. Our immediate focus is on digital books held by HathiTrust, a partnership of major research institutions and libraries working to ensure that the cultural record is preserved and accessible long into the future. This effort is funded by the HathiTrust and is part of U-M Library's ongoing efforts to understand the true copyright status of works in its collection. As part of this effort, the Library will develop policies, processes, and procedures that can be used by other HathiTrust partners to replicate a task that will ultimately require the hand-checking of millions of volumes. Bravo/a. I have no idea what will come of this, but pulling the default position of libraries, archives, and other institutions from one of debilitating fear or lawsuits to one of bravely sharing is something long past needed. By the end of the Twentieth Century, we had reached the point where a company with enough lobbyists and lawyers could do anything they wanted with copyrights, whether it was getting a de facto permanent extension for Mickey Mouse or even removing a work from the public domain. As mentioned before, this reveals some tremendous hypocrisies from major players.